Everett's Mike Sainristil enters the mid-way point of the season as a leading contender to grab the award. With the MIAA Football regular set to wind down in the next two weeks, we are excited to begin unveiling our 2018 MIAA Football Player of the Year candidates. Two seasons ago, Duxbury's Bobby Maimaron took home the honor, while last season King Philip's Shane Frommer won the award in a runaway. This year, we begin with five candidates, but players will have the opportunity to add their name into consideration as we gradually add to the while the season plays out over the next five weeks. Each week we will add one additional name to the list. We will then release our final 10 candidates for the award on the Monday of Super Bowl week. For now, here are our MIAA Football Mid-Season Player of the Year Candidates as selected by our panel of writers, correspondents, and editors. Who could have seen this coming? Sainristil is not only the most dangerous offensive weapon in Massachusetts so far this season, he is as equally lethal in the secondary. Sainristil may be known for his ability to high-point the ball and make eye-popping catches over opposing defensive backs but he is also capable of scoring via his ability to read a quarterback, jump a route, and use his speed to pick-off a pass and return it for six points the other way. The Crimson Tide have been at No. 1 for five straight weeks to begin the season in our Top 25 Poll and Sainristil is at the top of list when it comes to reasons why. So far on the year, Sainrisitl has 20 receptions and six touchdowns. Has also rushed for 173 yards and a pair of scores, intercepted four passes, and is averaging over 30 yards per punt return. Five games in and the Scarlet Knights have exceeded preseason expectations, with McElroy at the center of it all. The dual-threat quarterback has 814 passing yards to go with eight touchdowns through the air. On the ground, meanwhile, McElroy has amassed 112 rushing yards and a ninth score. McElroy's top performance so far this season came in a 49-14 victory over Lowell where he finished 12-of-17 for 332 passing yards and a pair of touchdowns. If this were fantasy football, Smith would probably file under the 'flex' position because he has just about done it all for the Rockets. When not being used as a run-blocker or in pass protection, Smith is a force when spread out wide or in the slot against defensive backs. His height and strength give him a consistent advantage, allowing him to use his ability to high-point the ball. As the season has rolled on, he's become as tough a cover as there is in the Bay State. 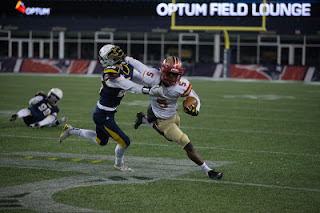 In helping to propel Needham to a 5-0 start, and the No. 5 spot in our poll, Smith has 29 receptions for 523 yards and five touchdowns. The Hawks defense has been a staple of their success, and Masse is just the latest focal point of the unit. Masse is in his second year as a starting linebacker for Xaverian and his impact has never been more valuable. Through five games, Masse has 39 tackles, 4.5 sacks, and a pair of forced fumbles. The Hawks are currently in a stretch in which they have not allowed a point in over seven and a half quarters. Masse has also been used out of the backfield from the fullback position on a number of occasions as the Hawks stick to their ground-and-pound ways. So far, he has 150 rushing yards, 60 receiving yards, and four touchdowns. Ford has been an integral part of three Super Bowl champions, and now as a senior he is trying to lead the Falcons to one final ring. As Mashpee has looked to keep its Massachusetts-high winning streak intact, it has heavily relied on Ford to carry the load and every time, he has delivered. In the Falcons 21-20 win over Abington, Ford had over 200 all-purpose yards, three touchdowns, and two interceptions. For the season, the Falcons centerpiece has three games of rushing for 110 yards or more and 10 touchdowns. Labels: high school sports , Jake McElroy , Mattt Smith , MIAA High School Football , Mike Sainristil , Needham football.